UNTIL MY SON PREPARED for a flight to Boston last spring to visit three colleges, I’d never heard of Tufts University. 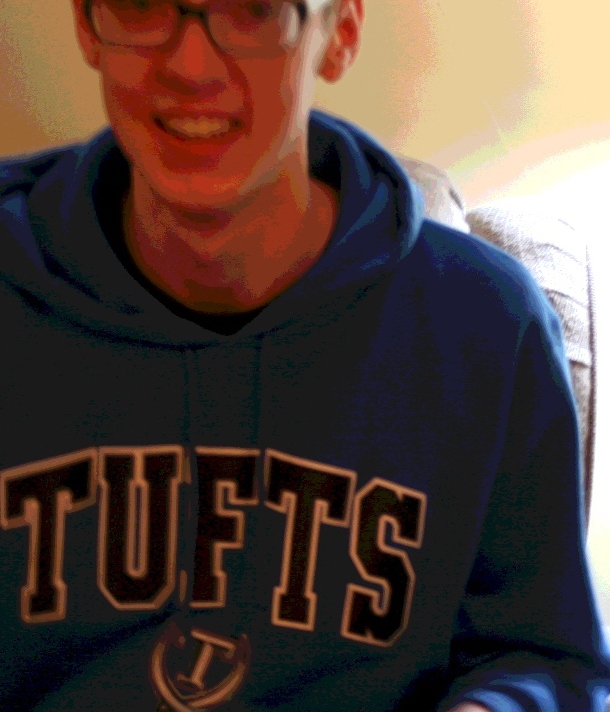 My son in a Tufts University sweatshirt. Edited Minnesota Prairie Roots photo. He had to spell out the name for me, T-U-F-T-S.
That was my introduction to the private research university he now attends after transferring from North Dakota State University. The move to Tufts’ Medford, Massachusetts, campus was the right one for him. He’s challenged in his studies and happy living in a metro area far from the wind-whipped plains of Fargo. I don’t necessarily think he would be where he is today, though, without that year at NDSU. But back to Tufts, which has a current student population of nearly 11,000 with 5,255 of them undergrads. Last Thursday I was watching NBC’s Parenthood. The TV show focuses on the lives of the Braverman family, including college student Drew. Drew’s girlfriend, Amy, is currently staying with him in his Berkeley dorm room. I missed the season 4 finale in which Amy revealed she’d gotten into Tufts. In Thursday’s episode, Amy shared that the girls at Tufts are snobby and everyone is smart and she simply cannot return there because she doesn’t fit in. Awhile ago, I asked my son if he ever felt out of place at Tufts. I mean, this is a college where lamb is served in the dining center and there’s a sailing team. Not exactly a part of his lower middle class upbringing. That all said, when the son was home in Minnesota for holiday break, we went clothes shopping. I swear he grew an inch or more in the three months since I’d seen him. About one thing he was adamant: “They don’t wear flannel shirts in Boston.” This from a 19-year-old who, only after entering college, began caring about attire. Not to say he dressed poorly. But fashion simply never mattered much to him. Now he’s back at Tufts with these new clothes: four sweaters, three pairs of jeans, grey pants, and a winter scarf (in Tufts colors). 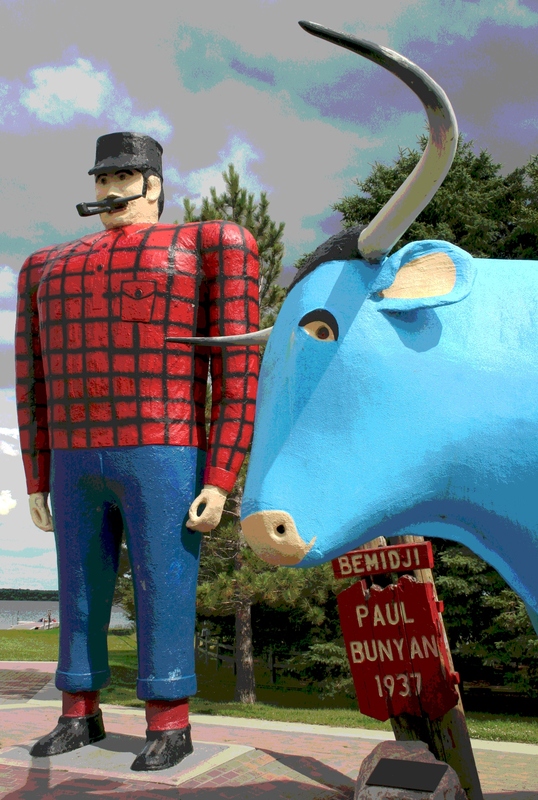 Legendary Paul Bunyan (dressed in his flannel lumberjack shirt) and Babe the Blue Ox in Bemidji, Minnesota. Minnesota Prairie Roots edited file photo. Surprisingly, though, he took his flannel back to Boston, too. He likely can wear the shirts, unnoticed, under his new sweaters. Had he left his flannel shirts behind in Minnesota, I would have swiped them. I take no shame in dressing like Paul Bunyan. FYI: Click here to reach Tufts’ Facebook page and the latest on the university’s mention in the Doonesbury comic strip. Congratulations on your son’s admission to Tufts. He’ll surely get a good education. Sounds like he’s well grounded so shouldn’t lose his way in that hallowed academic atmosphere. Glad he’s such an achiever! He seems happy at Tufts and challenged and that is good. I thought of you when I watched Parenthood last week, too!!! I almost emailed you but then thought that was silly because you probably had no idea what that show even was! I was wrong!!!! 🙂 I laughed at the no flannel shirts at Tufts. I am sure they dress a bit differently as they do at other Eastern schools but hopefully no one bullies anyone about poor fashion sense—-I would be in huge trouble if I went to one of those schools ! Great post as always!!!! Go Tufts! Parenthood happens to be one of my favorite shows. I don’t watch much TV, but I really do not like to miss Parenthood or Shark Tank and now, of course, Downton Abbey. That’s three shows. Yikes. I love flannel shirts. I’m wearing one right now. Great post! Such a good balance of family, a known public place, and humor. 🙂 I knew about Tufts, but I did not know their financial policy – that is truly awesome. I’m so glad that your son is enjoying his experience there. What an honor to be a student at such a great school. I agree that it’s an honor to be among those admitted to Tufts. Admittance does not come without a lot of hard work and potential. I’m looking forward to seeing where your boy goes in his life!! Me, too. In a few more years we will know. This summer he’s interning for a company in Boston. Your son has a great perspective on life – love that:) I like the philosophy of Tufts and its student population – great way to earn a quality education based on one’s ability! I can say I moved away from the flannel in moving Out West and who knows maybe it will make a come back one day for me. Happy Hump Day! Now I understand that thought of not ruling out a university because you can’t afford it. That said, my son was accepted to four other outstanding private universities with Tufts being the only one to offer enough financial aid to make attendance a possibility. We are truly thankful for Tufts’ approach to financial aid. I agree. He’s blessed with this opportunity. transferred to U of M in Mpls. He said it is so flat up there and too far from home. I thought southwestern Minnesota was flat, but not compared to Fargo. I can understand why my son and your grandson didn’t like the flat and the endless wind, oh, the wind. I had a difficult time with both in Fargo and I’m used to prairie. I’m so sorry your Dan has experienced crime first-hand at the U. He sounds like one bright student and what a great goal he has to become a physician’s assistant. You never know. He may end up in a rural area. Yes, I am proud of my son’s independence and adventuresome spirit. He knew where he needed to be and forged ahead. The deepest satisfaction for me is knowing that my son is happy where he’s at now, learning and thriving, albeit 1,300 miles from Minnesota. Congrats to Arabella on getting accepted into Sydney Uni. It sounds like a good place to be. And, bonus, you’ll have that peace of mind that she’s getting there via public transportation and not your car. That’s the great thing about the Boston area. The region has a really good mass transit system. Hope he keeps wearing his flannel — proudly! Probably under a sweater, though. I wear my flannel proudly. Such an honor for Caleb to be a highly qualified applicant….and then to actually be accepted. Did you ever in your wildest dreams see Caleb going to college some day at a prestigious school on the East coast. I’m glad for Caleb and for You & Randy….you must be so proud, there is no better feeling then knowing your children are happy and doing well for themselves! Actually, I’m not surprised. Caleb loves to learn and, after that year at NDSU, plus some major career accomplishments and experiences, he was ready for a change. I’m just happy that he’s happy.